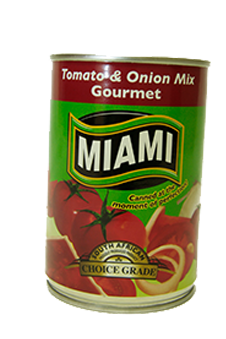 Diced tomatoes mixed with a combination of chopped onions chillies and spices. 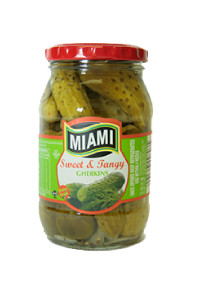 Cooked to a relish consistency. 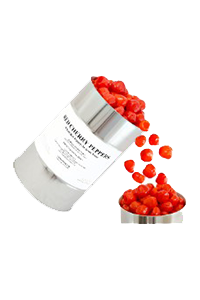 This product can be used, heated, as a sauce for pap or as an addition to stews, casseroles or curries. 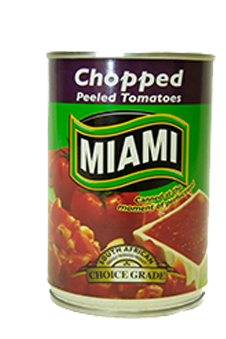 Chopped peeled tomato pieces combined with fresh tomato juice and a little salt to create a great fresh tomato base. 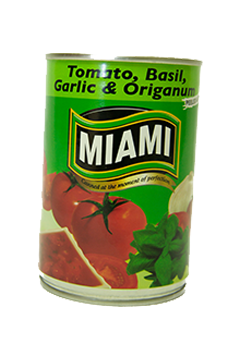 Chopped tomato pieces combined with garlic, basil and origanum in fresh tomato juice creates a great base for Italian inspired dishes. 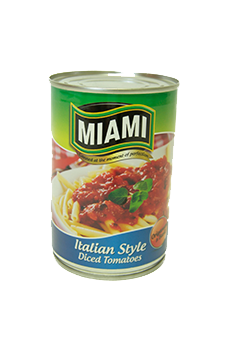 Chopped tomato pieces combined with garlic, basil and origanum cooked to a relish consistency. 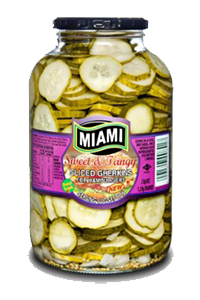 Great as a base for Italian inspired dishes. 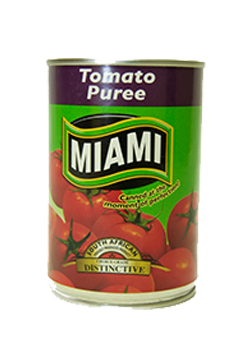 Chopped tomato pieces combined with aromatic Indian herbs and spices cooked to a relish consistency. 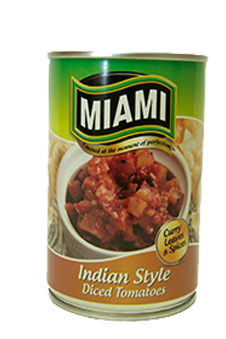 Great as a base for Indian inspired dishes. 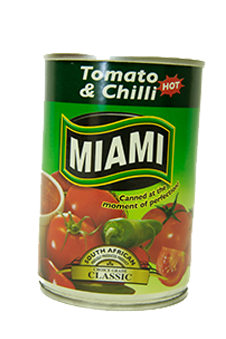 Chopped tomato pieces combined with spicy BBQ and chilli cooked to a relish consistency. 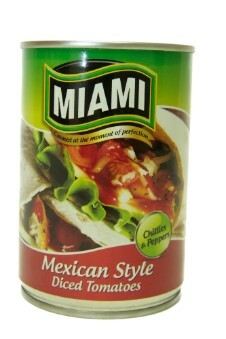 Great as a base for Mexican inspired dishes. 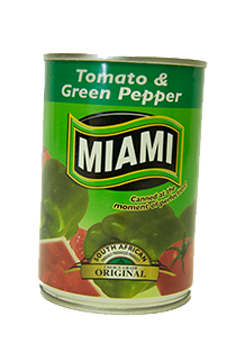 Diced tomatoes cooked to a saucy relish consistency with green pepper. 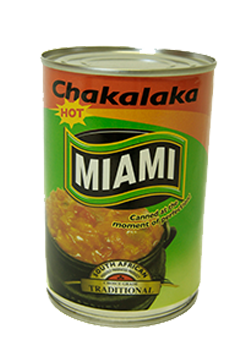 This product can be used heated as a sauce for pap or as an addition to stews, casseroles or curries. 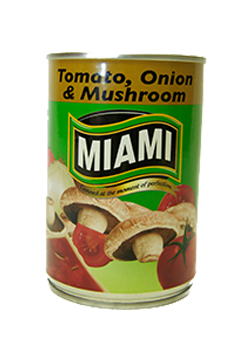 Diced tomatoes, mixed with a combination of onions, herbs, spices and sliced mushrooms. Cooked to a saucy relish consistency. 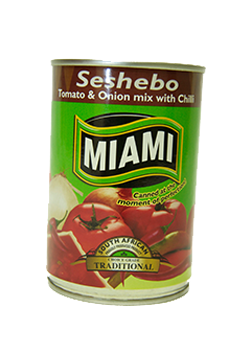 This product can be used heated as a sauce for pap or as an addition to stews, casseroles or curries. 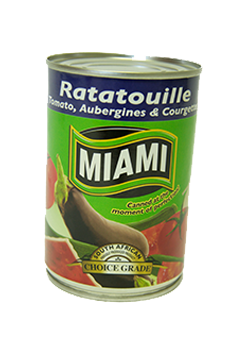 Diced tomatoes, onions, aubergines and courgettes cooked together with aromatic spices to a chunky relish consistency. 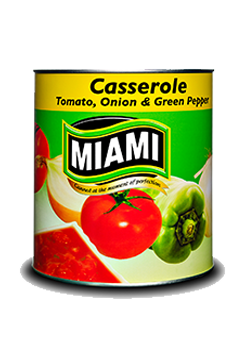 This product can be used heated as a sauce for pap or as an addition to stews, casseroles or curries. 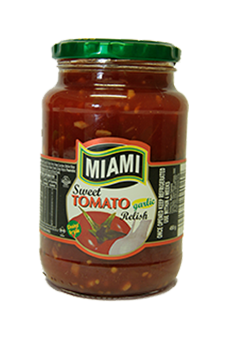 Diced tomatoes cooked to a saucy relish consistency with chillies. 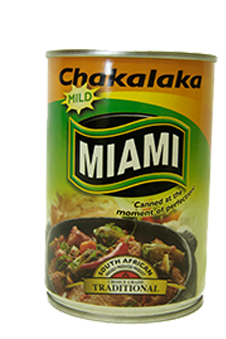 This product can be used heated as a sauce for pap or as an addition to stews, casseroles or curries. 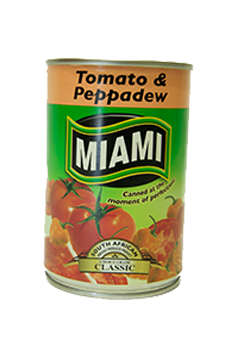 Diced tomatoes, mixed with sliced piquant peppers. Cooked to a saucy relish consistency. 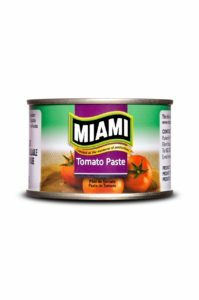 This product can be used heated as a sauce for pap or as an addition to stews, casseroles or curries. 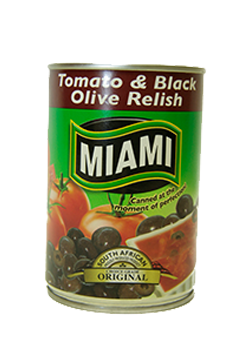 Diced tomatoes, mixed with sliced black olives. Cooked to a saucy relish consistency. 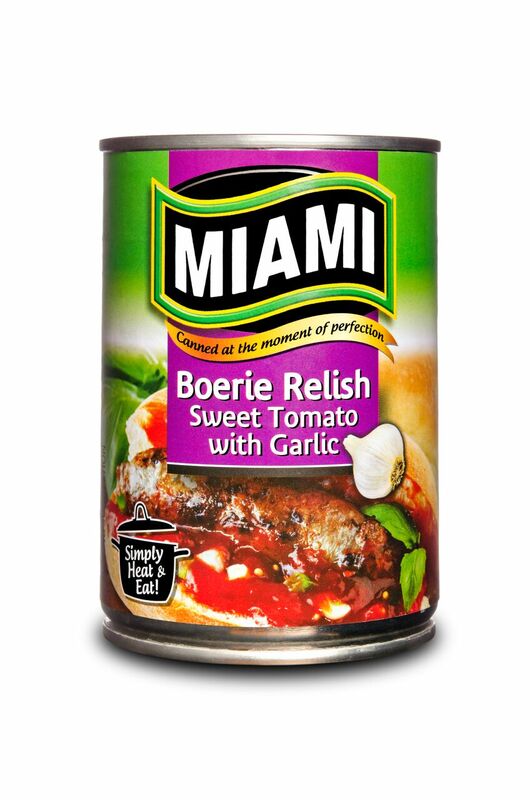 This product can be used heated as a sauce for pap or as an addition to stews, casseroles or curries. 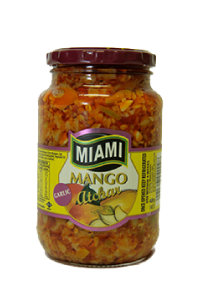 A combination of shredded cabbage and carrots, chopped onions and tomatoes, cooked together with curry flavours and other aromatic herbs and spices to chunky, thick relish. 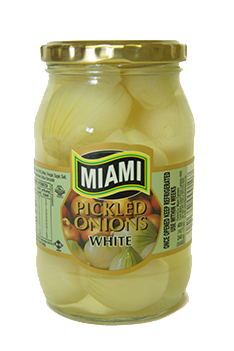 This product can be used heated as a sauce for pap or as an addition to stews, casseroles or curries. 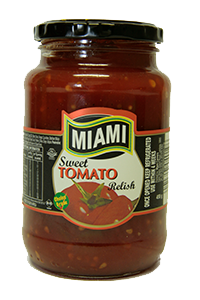 A sweet tomato based relish with a chutney type texture and flavour. Great used hot or cold. 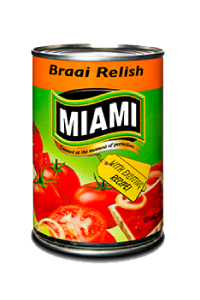 Hot as a sauce or gravy over pap. 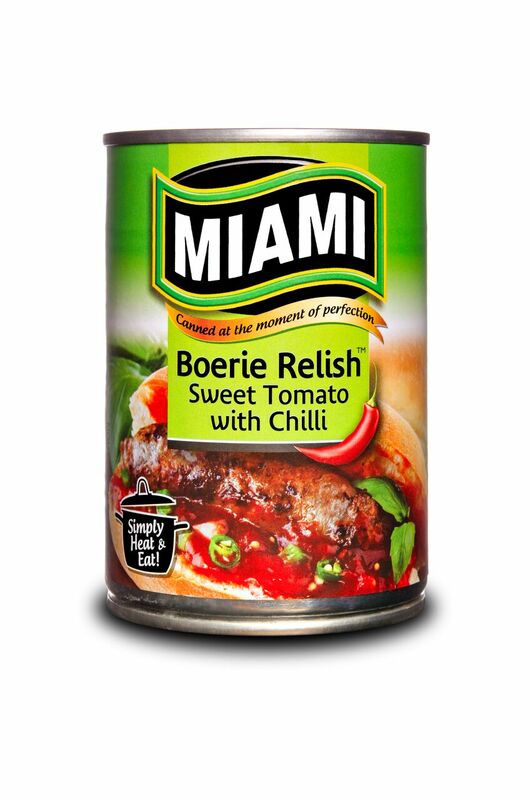 Cold straight out of the bottle as a side for cold meat, boerewors rolls, or any meat dish. 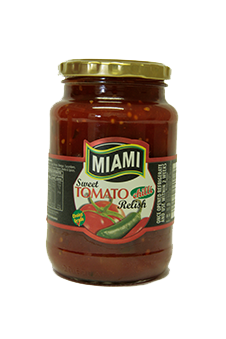 A sweet tomato based relish with a chutney type texture and flavour. Great used hot or cold. 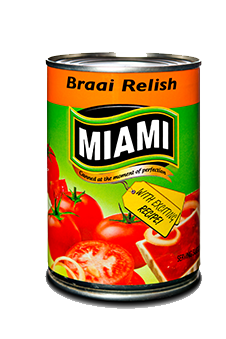 Hot as a sauce or gravy over pap. 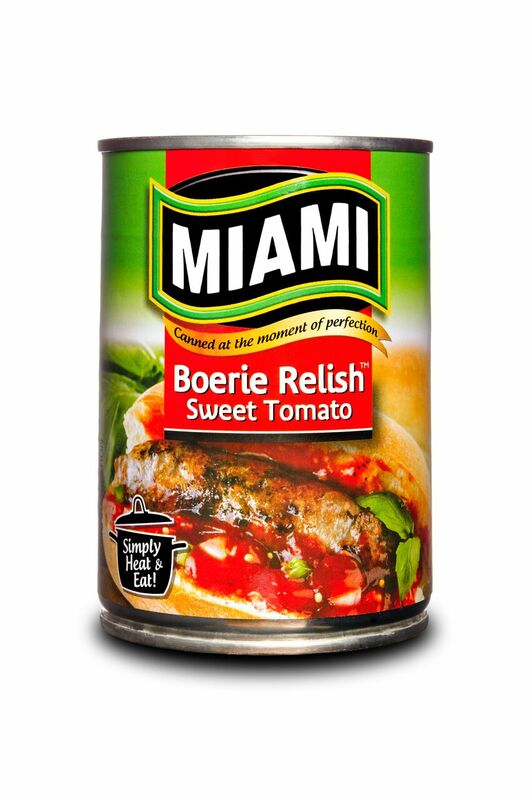 Cold, straight out of the bottle, as a side for cold meat, boerewors rolls, or any meat dish.